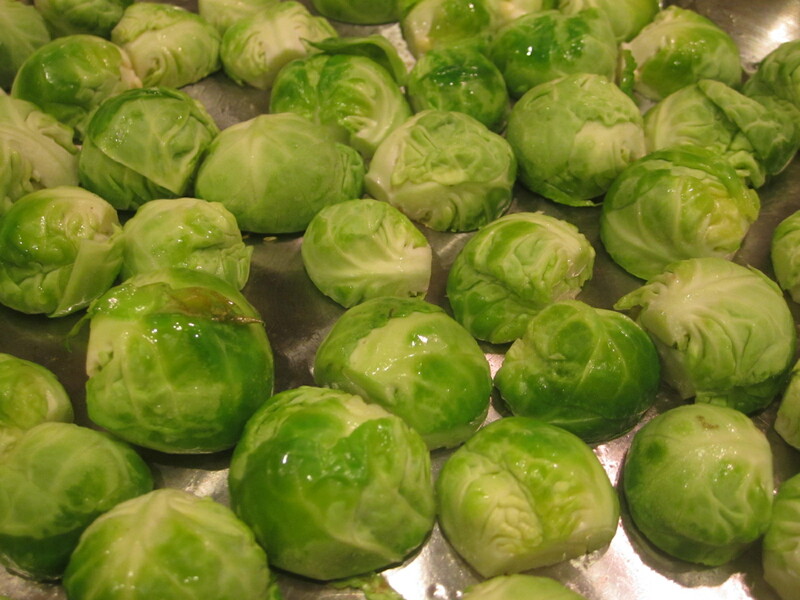 I can honestly say that brussels sprouts might be my favorite vegetable. 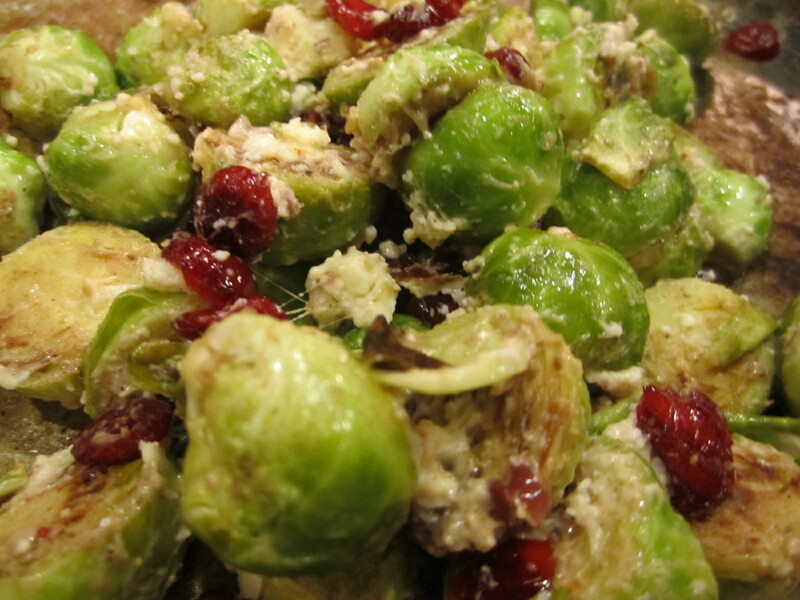 People either love or hate brussels sprouts, I don’t think that there is anything in between. They can have a bitter taste if not cooked properly, but they are yummy and crunchy is cooked well! 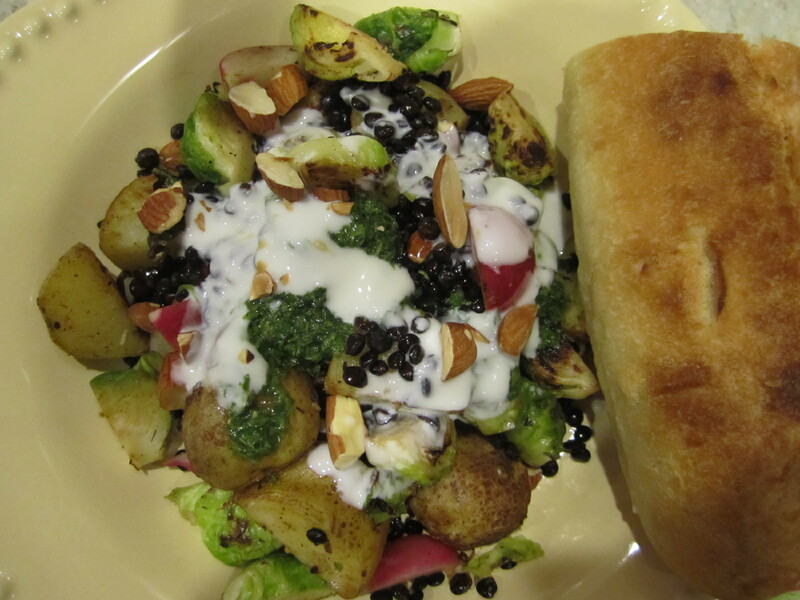 Last night we made another dish from 101cookbooks.com with some substitutions. 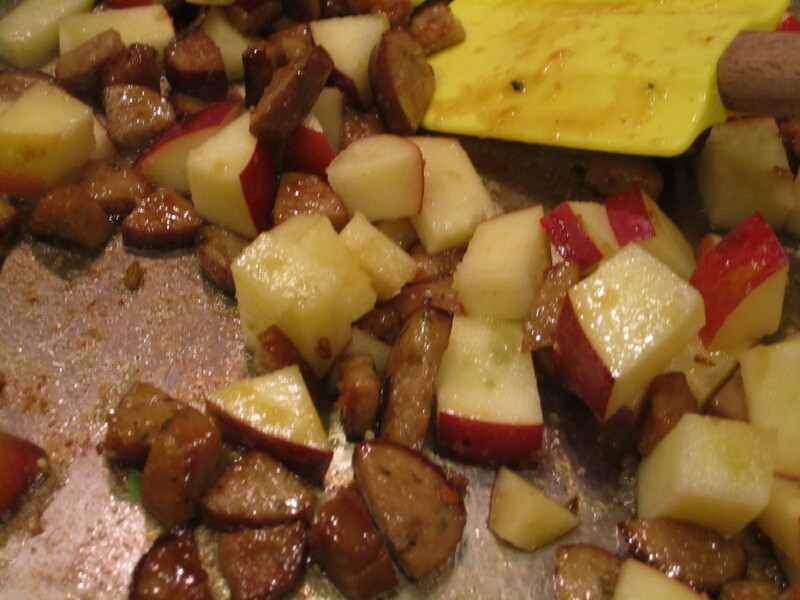 The chicken/tofu and apples are sauteed with maple syrup giving the a subtle sweetness. 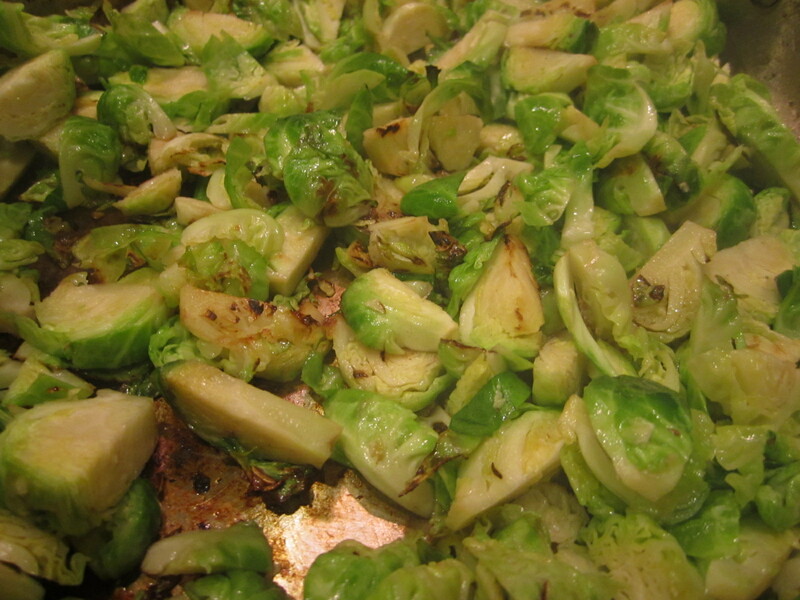 And, the brussels sprouts are cooked until browned and caramelized. 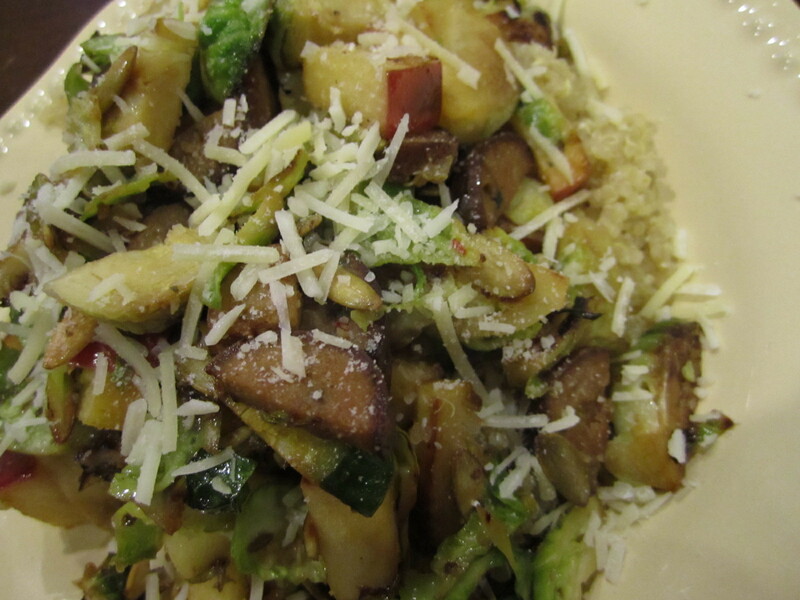 Everything mixed together was delicious! 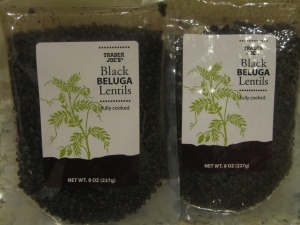 We served this over a bed of quinoa (cooked, then mixed with 1 tbsp maple syrup, salt and pepper) and sprinkled it with some freshly grated parmesan cheese. 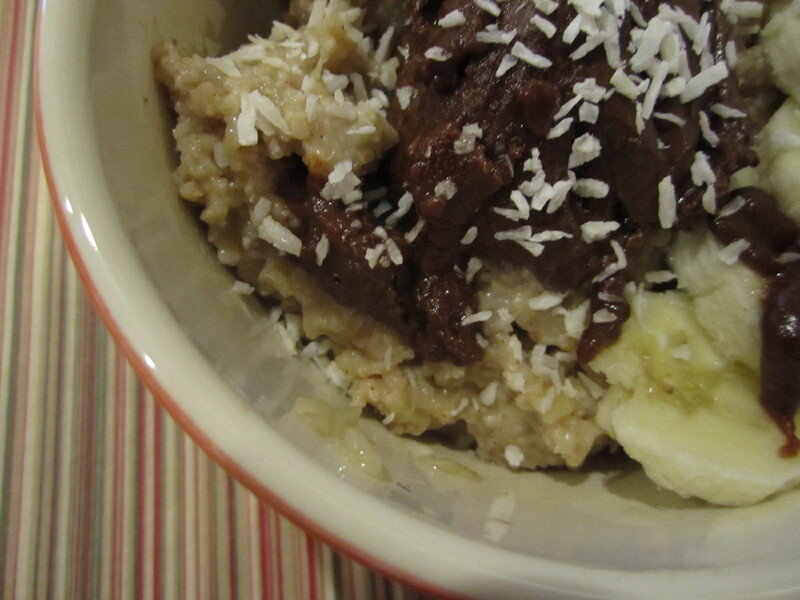 Backing up to breakfast, which was a yummy bowl of oatbran cooked with 1/2 banana, vanilla and cinnamon. 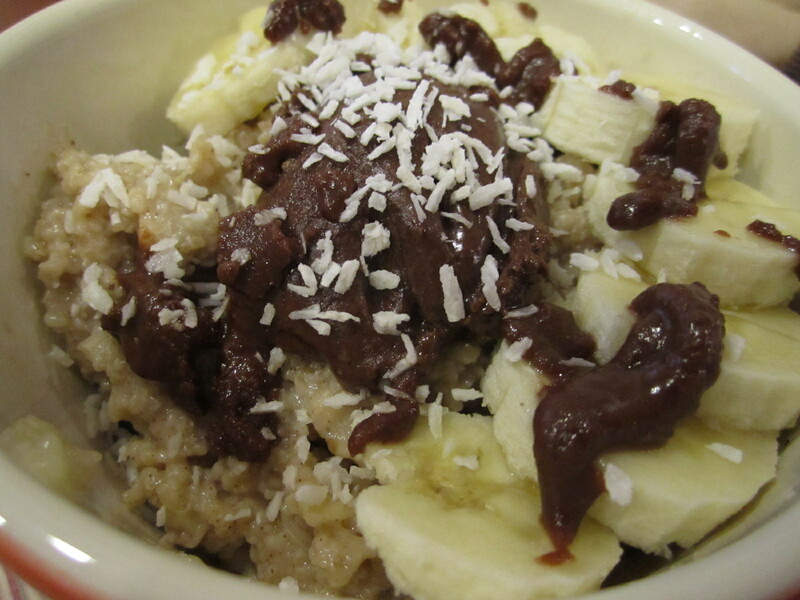 Topped with chocolate almond butter, banana slices and coconut. 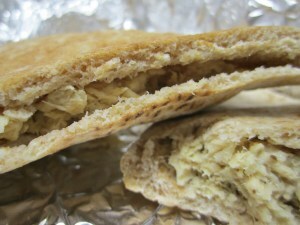 Lunch was a tuna fish sandwich mixed with dijon mustard, relish and stuffed into a pita. With an apple on the side. …and headed out for a 45 minute jog. It was chilly, but felt great to be active outside in the cool weather. 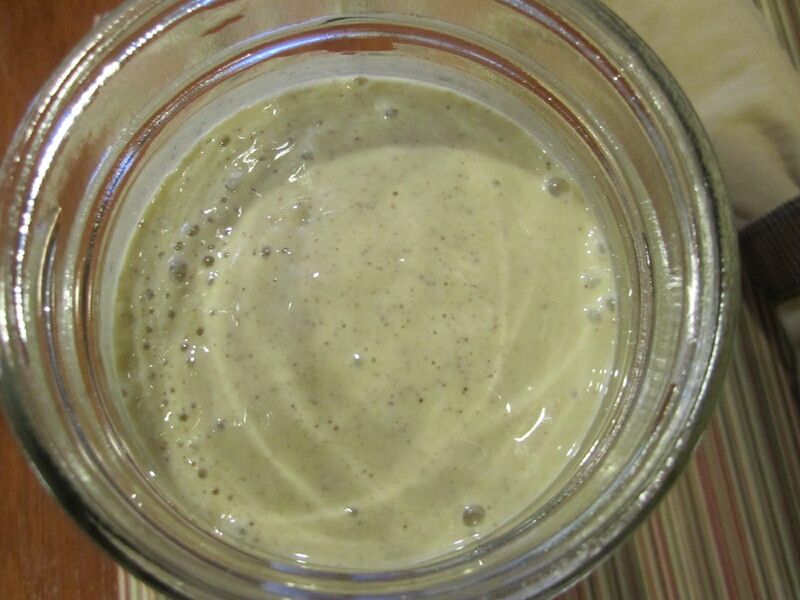 Yesterday morning, I made up my new favorite smoothie again – Butterfinger! It’s funny, I definitely go through phases. 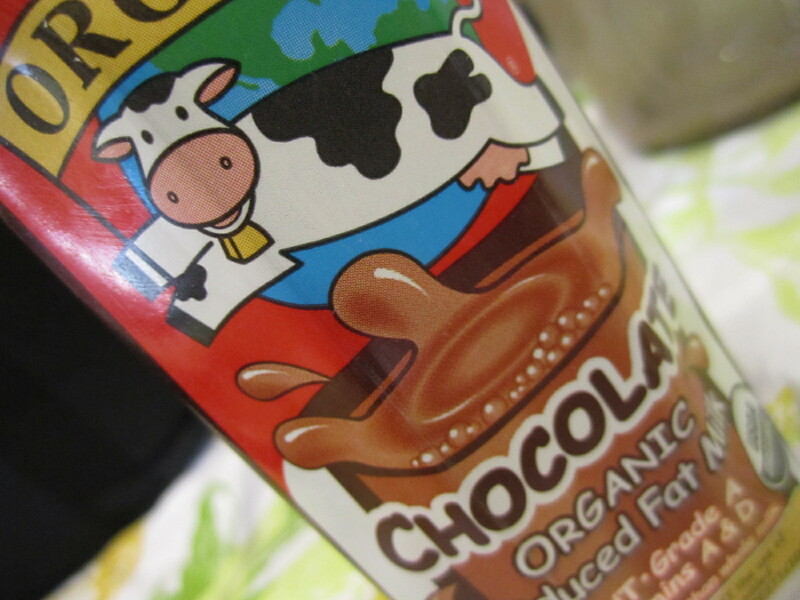 A few months ago, I couldn’t get enough of the Chocolate Cherry Bomb Smoothie, but now all I want is Butterfinger! 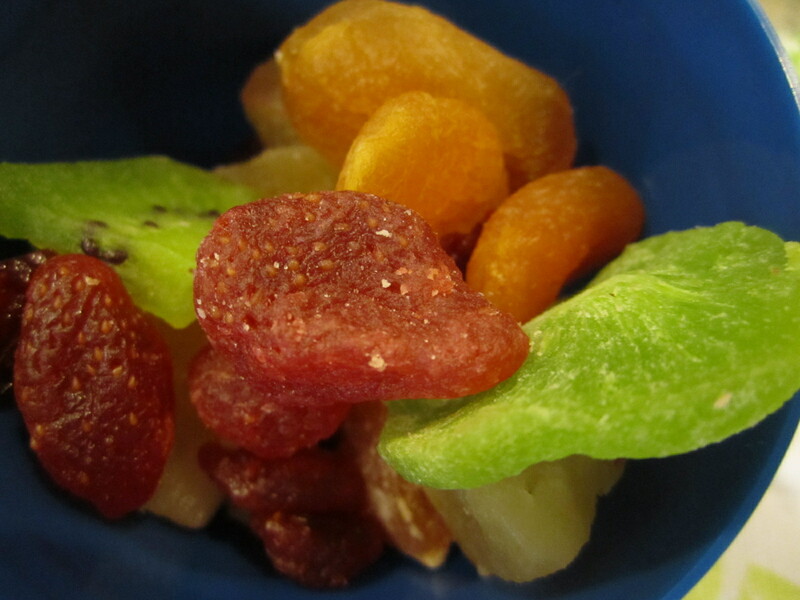 Mid-morning, I snacked on some dried fruit that I picked up at the Farmer’s Market this past weekend. Dried kiwi, pineapple, strawberries, cherries, papaya and golden delicious apples. 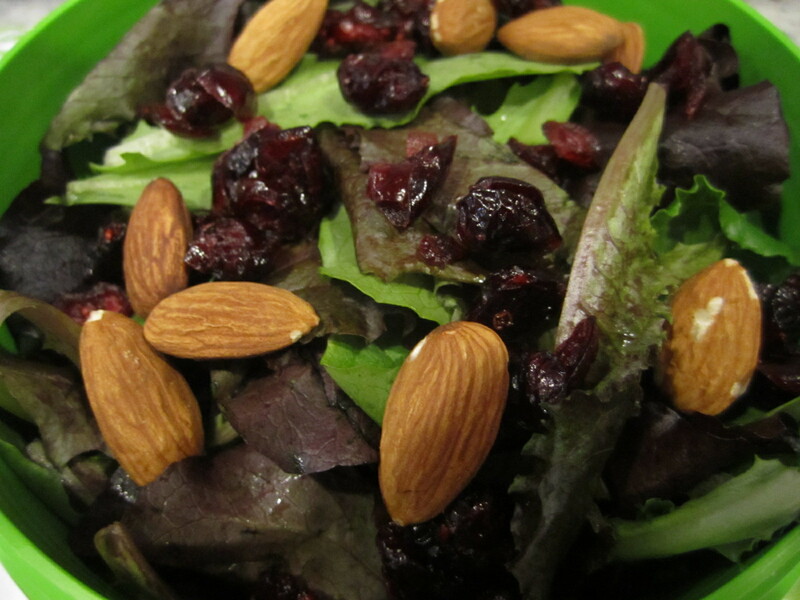 Romaine lettuce with dried cranberries, almonds, apple and honey balsamic dressing. This is my favorite salad! 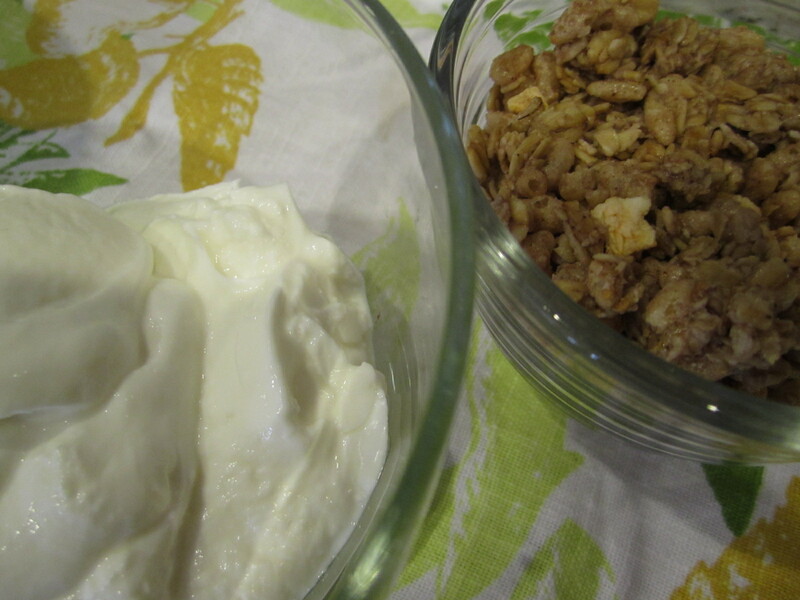 Plain greek yogurt with granola and honey. 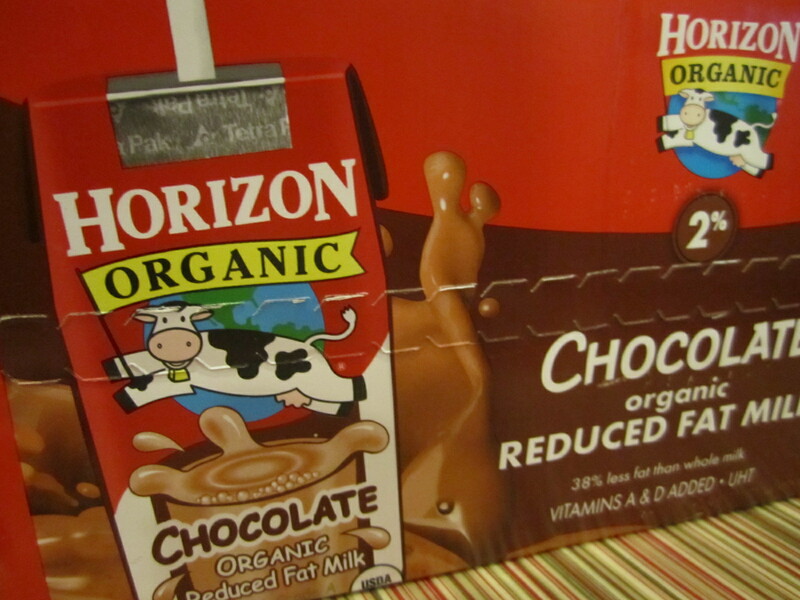 Mid-afternoon, I was craving some chocolate milk! After a 30 minute walk around the neighborhood, Brant and I got started on dinner. 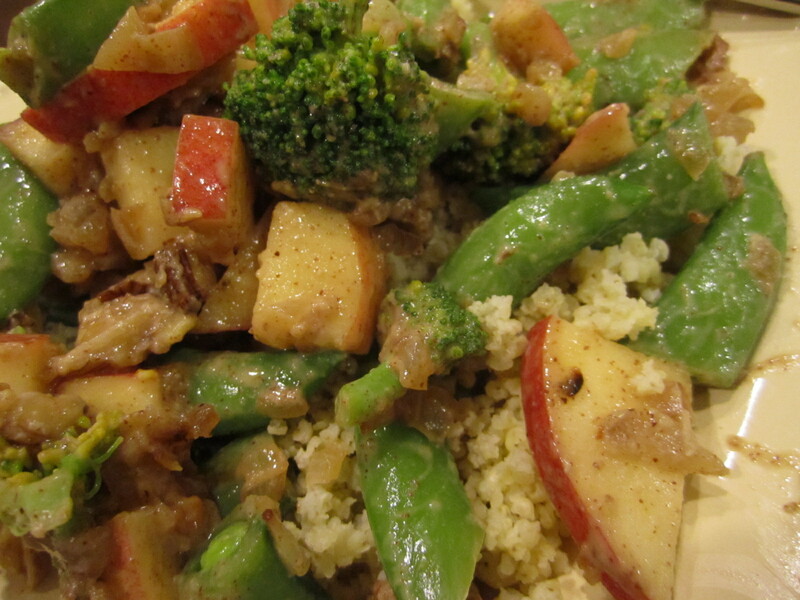 It has been awhile since we’ve made a dish from 101cookbooks.com, so we tried one out tonight. 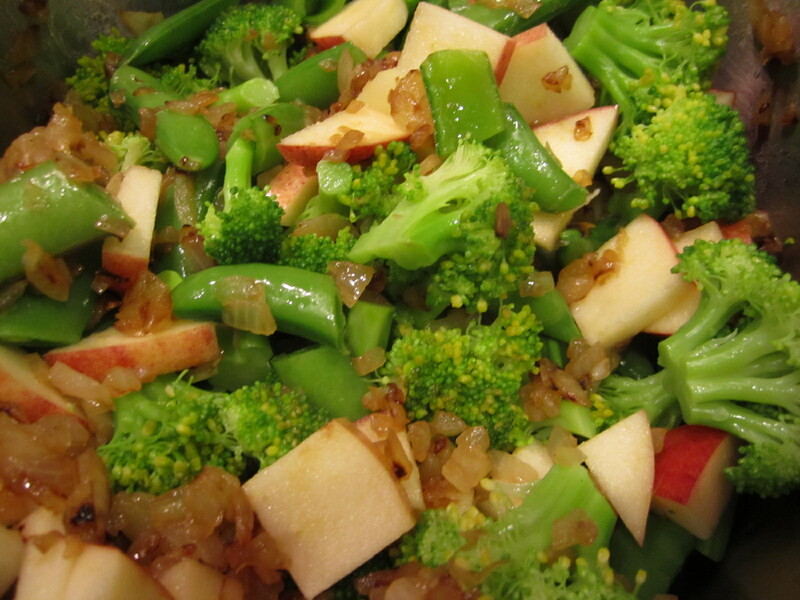 We followed the recipe exactly, except we subbed onions for shallots and added sugar snap peas for 1/2 of the broccoli. We caramelized the onions until sweet. 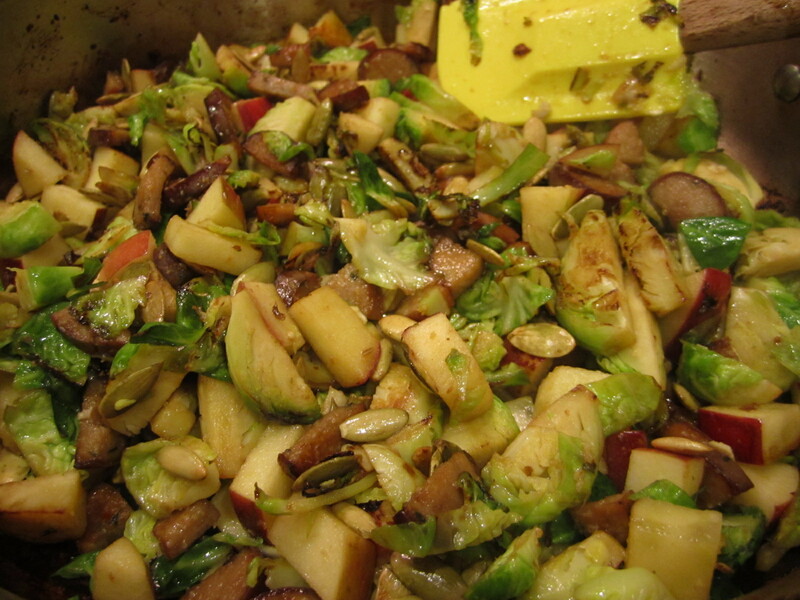 Mix all of the veggies/nuts/fruits in a bowl. 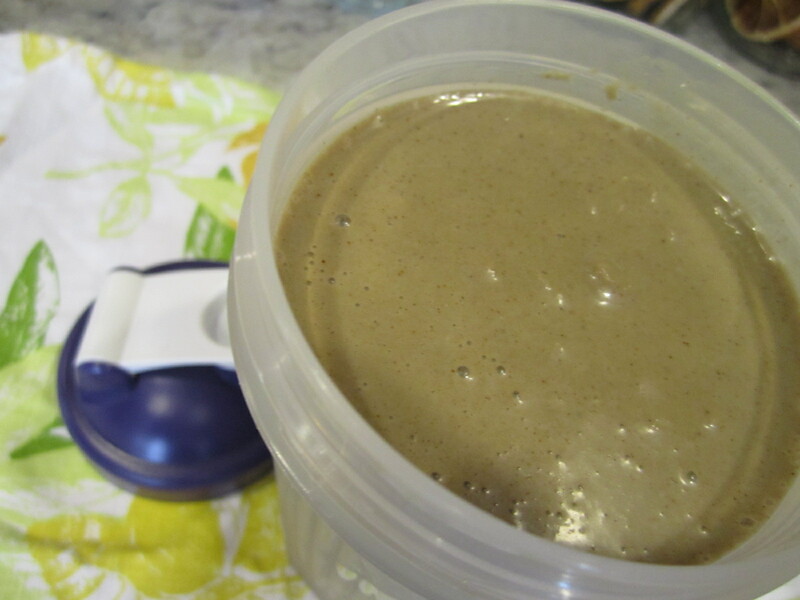 Then, add the delicious almond butter sauce! 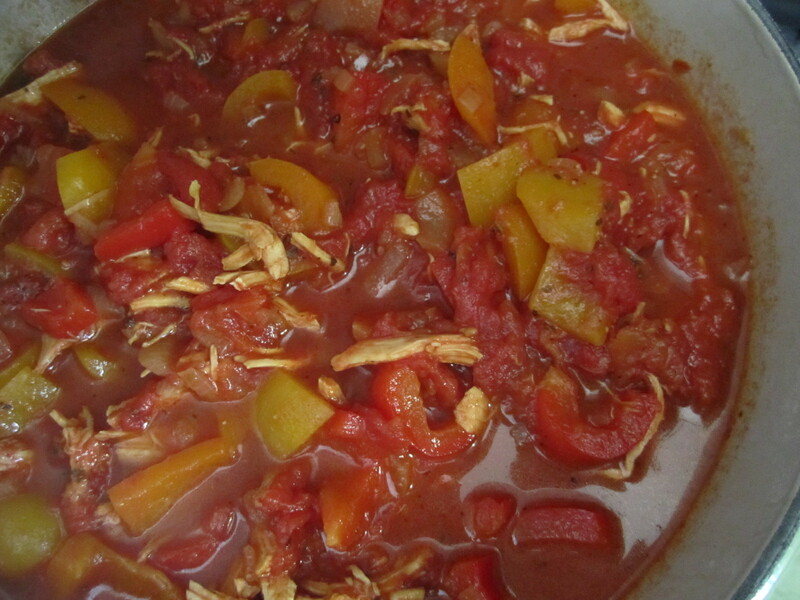 The sauce is by far the best part of the dish…next time, I would make extra! 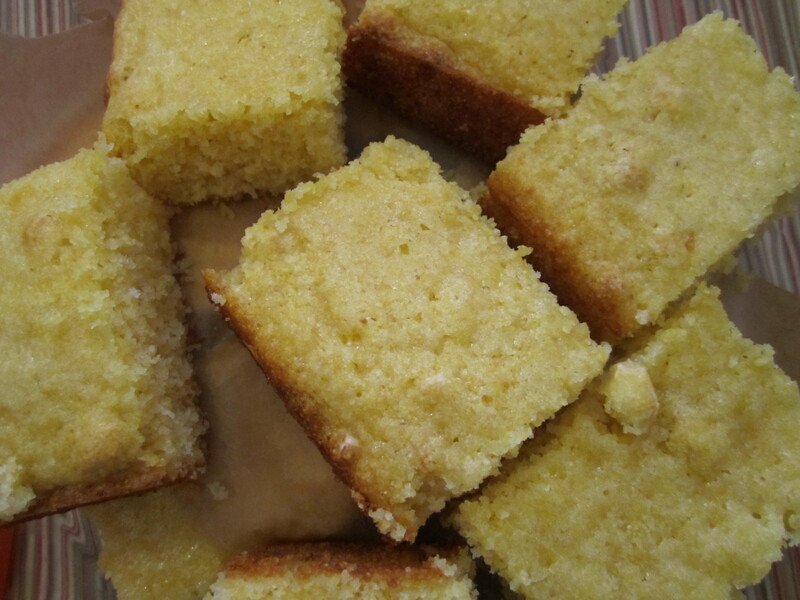 Served over a bed of millet (cooked in our rice cooker with salt, pepper and olive oil – about 40 minutes). 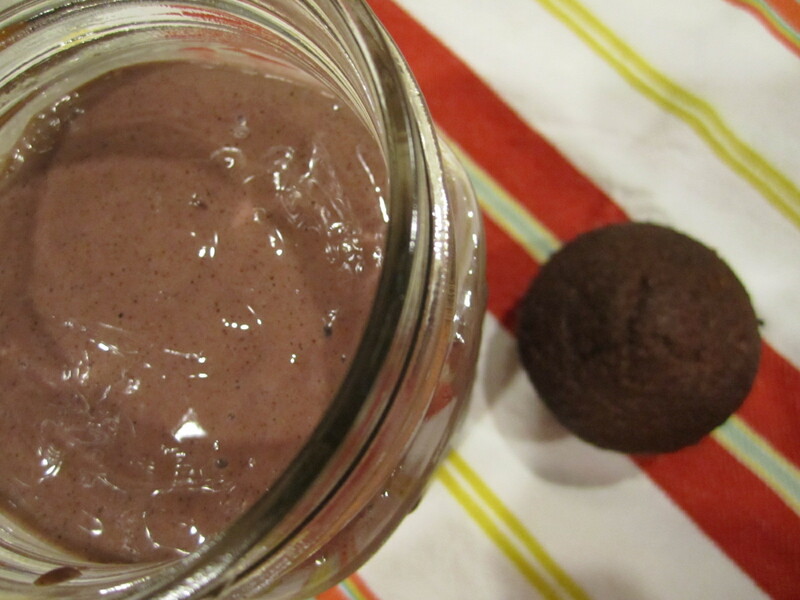 This recipe was simple, quick and delicious. 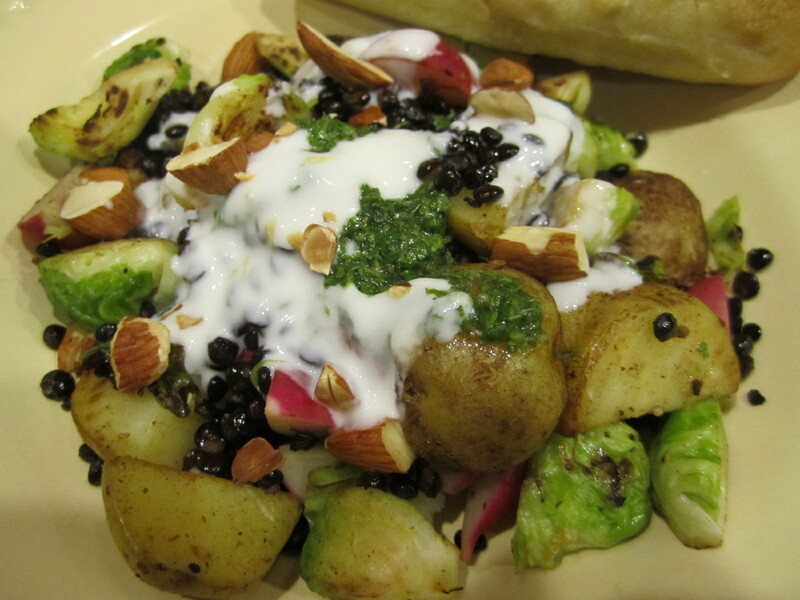 Can’t get much better than that for a weeknight meal! There were plenty of leftovers for lunch today, we well! I haven’t been posting nearly as much as I normally do. Life is just simply getting in the way. 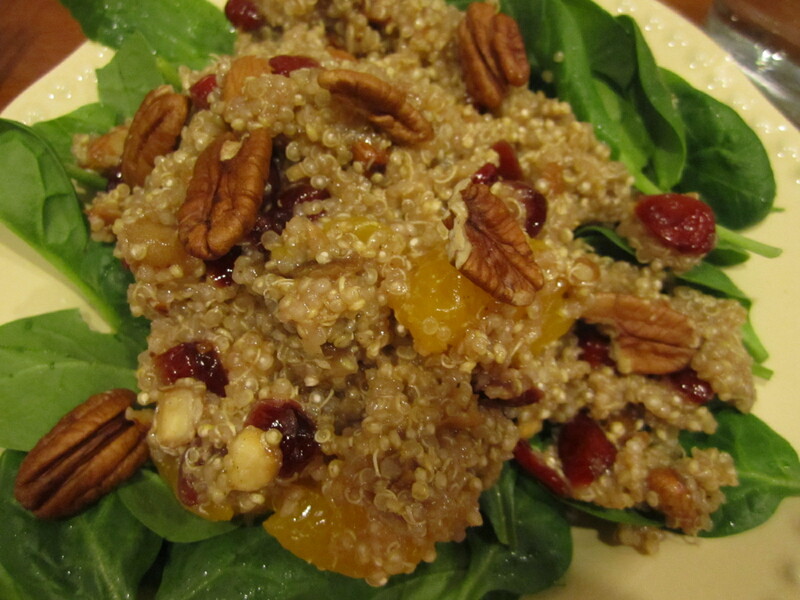 But, you can rest assured that I am still eating like I normally do – just more! 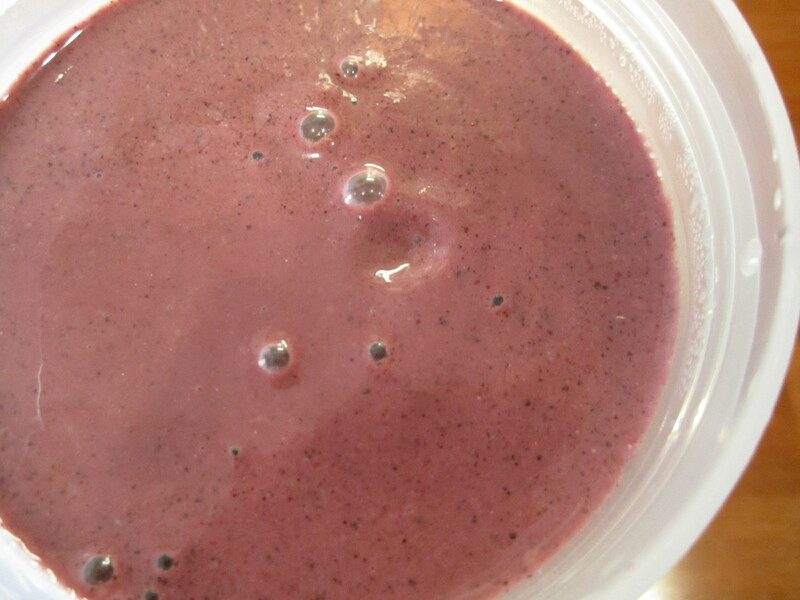 My favorite Chocolate Cherry Bomb Smoothie. 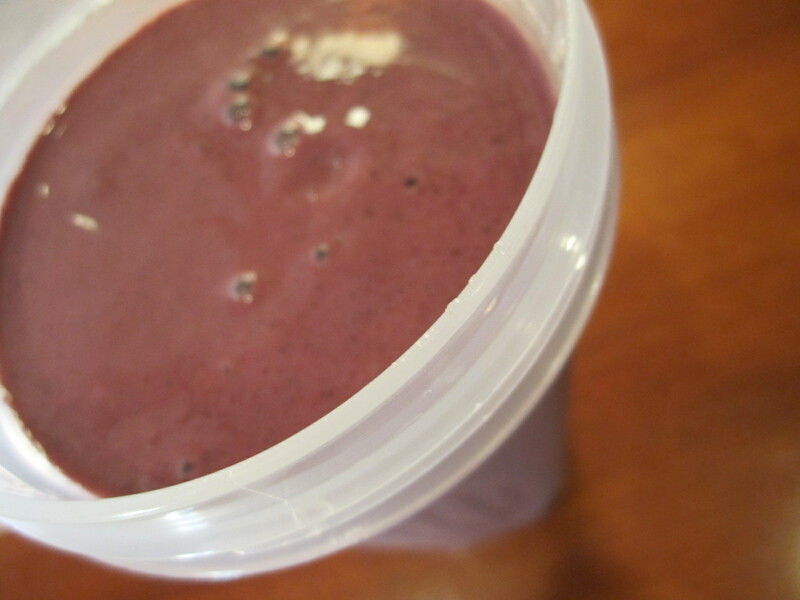 This smoothie is thick, delicious and packed with protein and nutrients which is perfect for my growing belly! 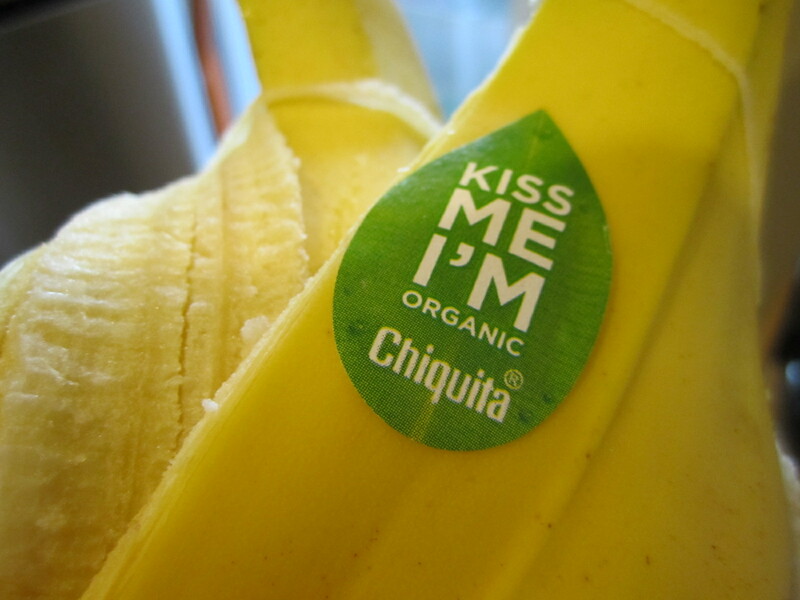 Check out the banana that I used today! 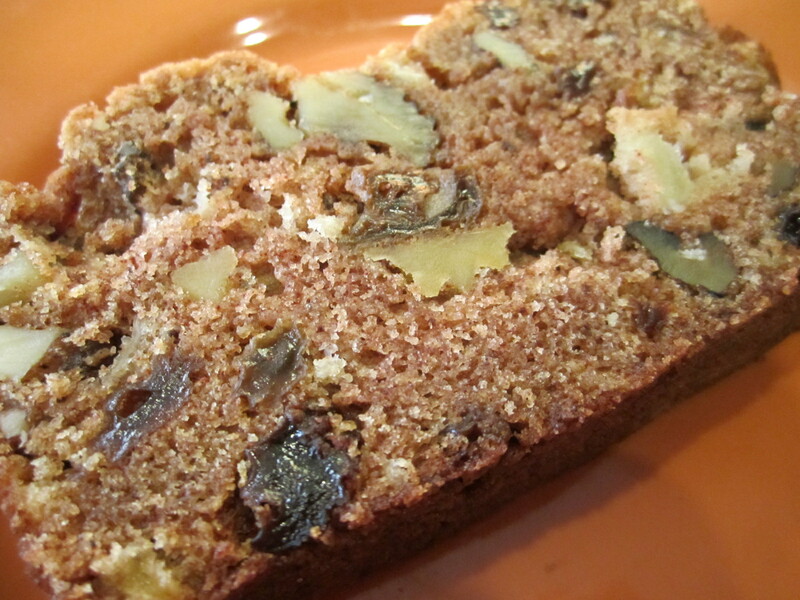 Along with my smoothie, I snacked on a piece of homemade apple raisin walnut bread made by Lauren. 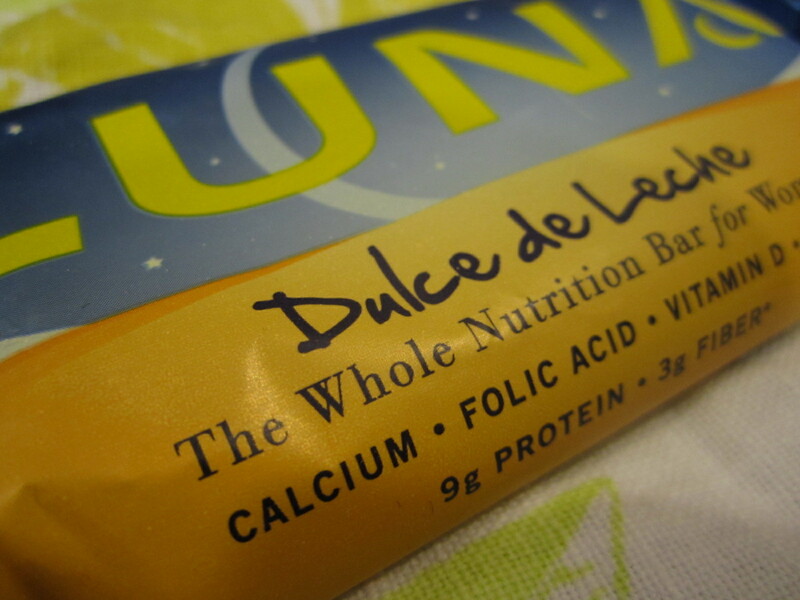 It is super delicious! Lunch included some leftovers from dinner. 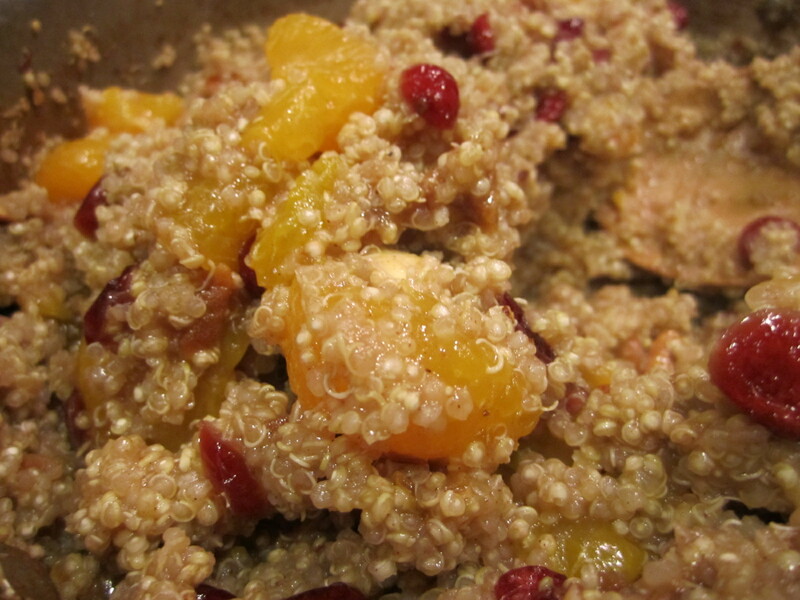 I decided to try out Angela’s Mandarin & Maple Spiced Quinoa with Cranberries, Apricots, and Almonds. 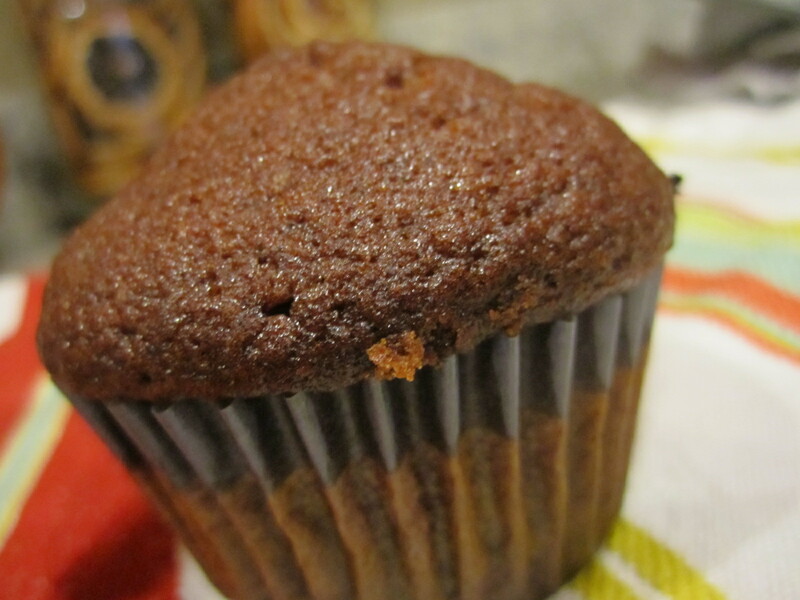 It was sweet from the maple and dried fruit and spicy from the cinnamon and nutmeg. We all really loved it. I will definitely be making it again! 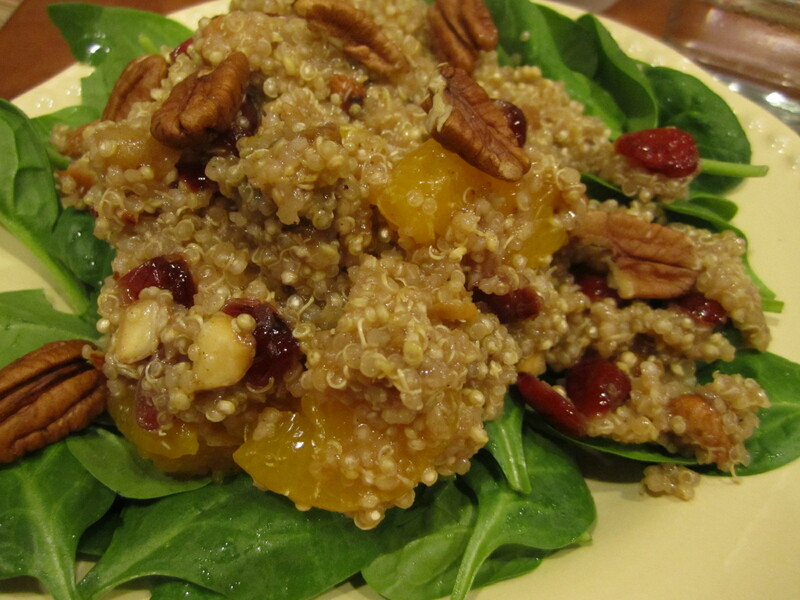 Served on a bed of spinach for some greens with dinner. Definitely go try it out! It will be a crowd pleaser. 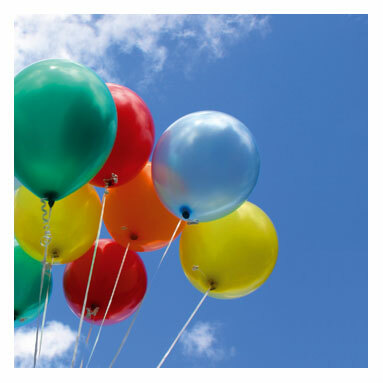 I am so excited for the weekend…lot’s of stuff to do. 🙂 Have a great one! Despite daylight savings and it being lighter earlier in the mornings, I seem to be having more trouble waking up! Maybe it’s my body telling me I need more sleep? Maybe it’s because I’m not sleeping well at night? Who knows! 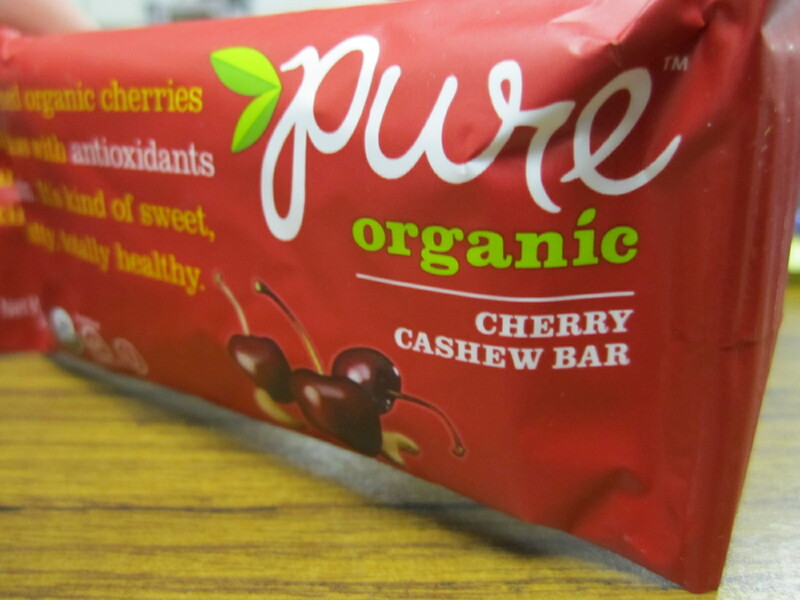 It was a bit chunkier than a Larabar, but had a similar texture. 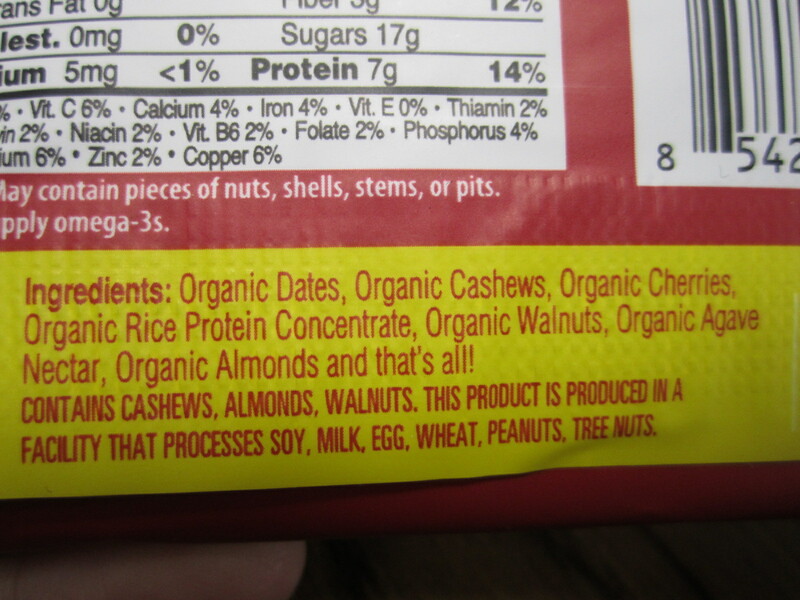 And, a great ingredient list! 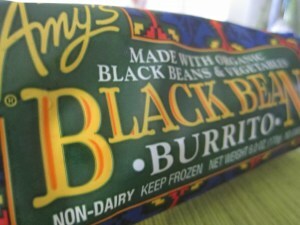 For lunch, I heated up an Amy’s Burrito. There were slim pickings in our fridge yesterday, luckily Brant headed to the grocery store last night! 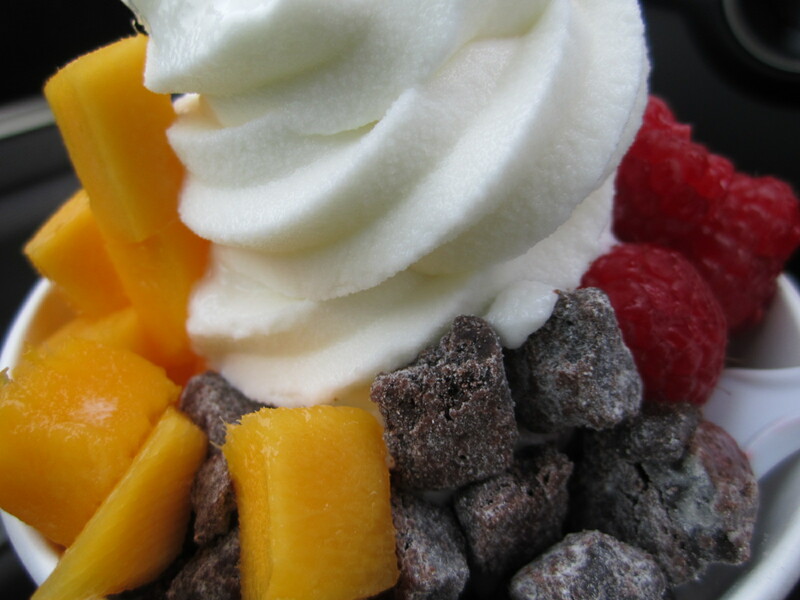 I ran out to do a few errands, and PinkBerry just happened to be there! A small tart with mango, raspberries and brownie bites…mmmm…. For dinner, I was half creative and half boring! 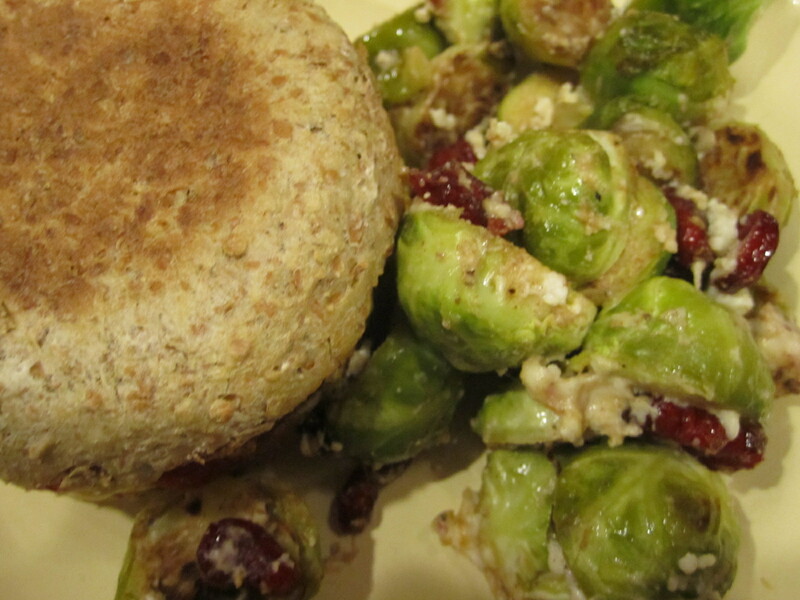 A veggie burger on an english muffin with a side of Brussels Sprouts. 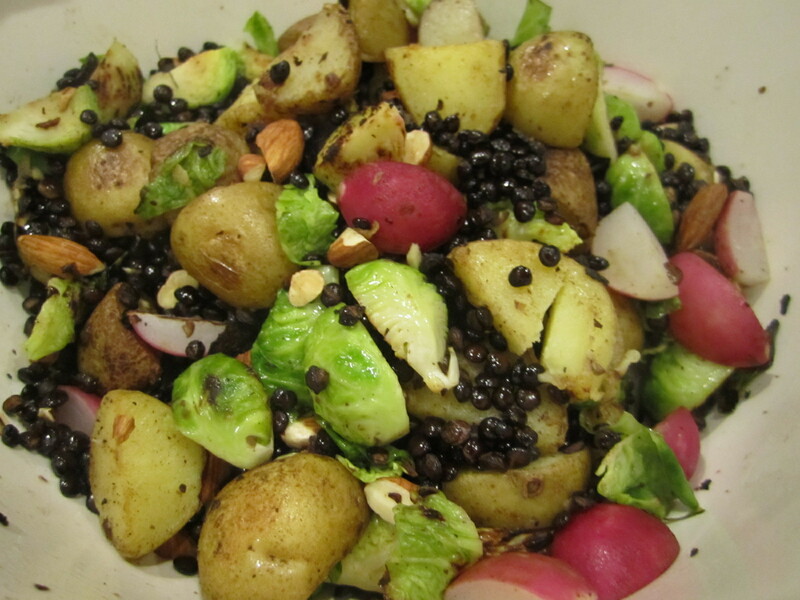 For the delicious brussels sprouts, I tried something a little bit new. 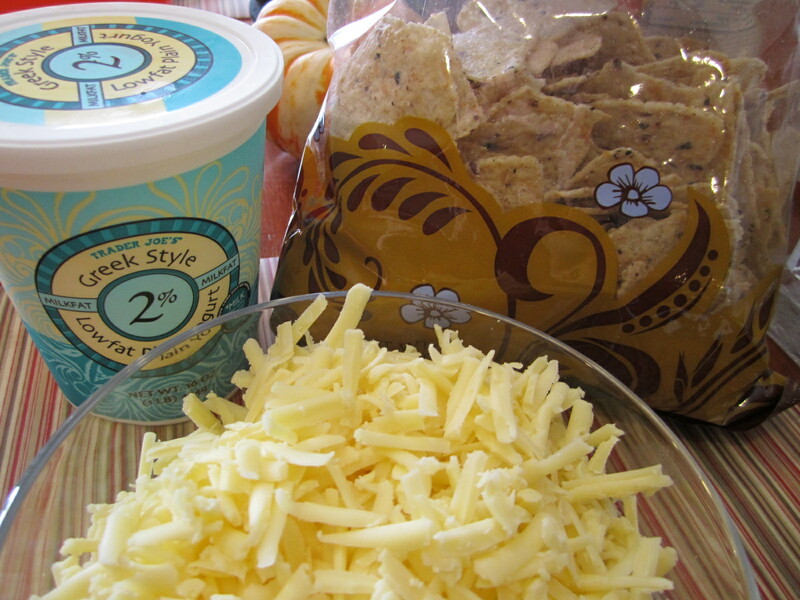 They would be perfect for a holiday dinner! 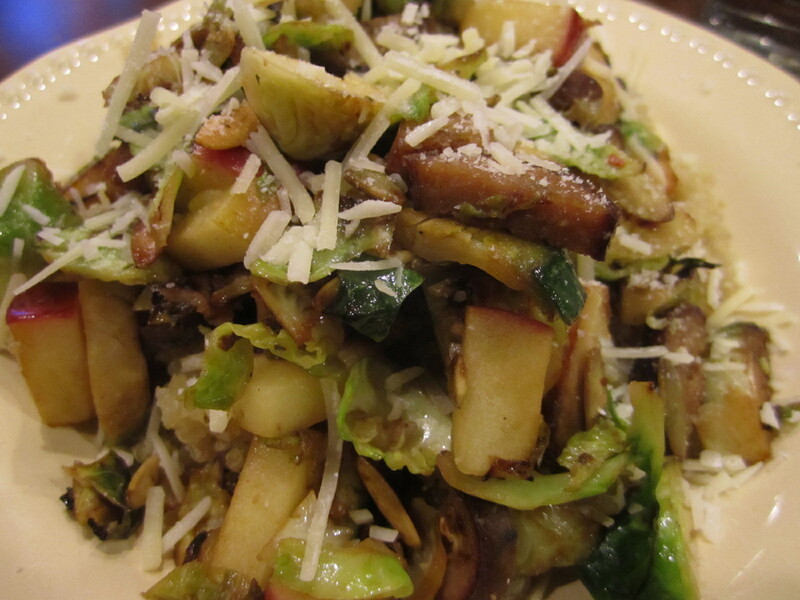 First, wash, rise and chop your brussels sprouts. 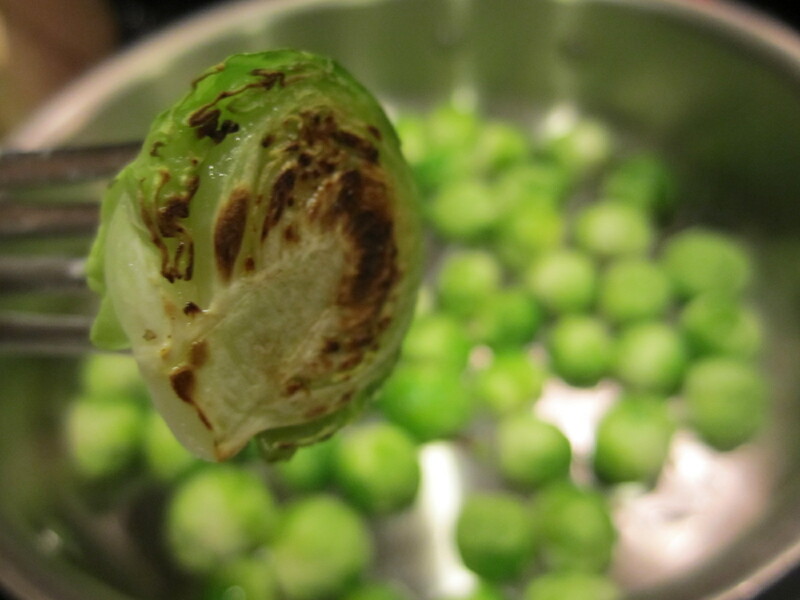 Then add them to a heated skillet with 1-2 tbsp of olive oil. 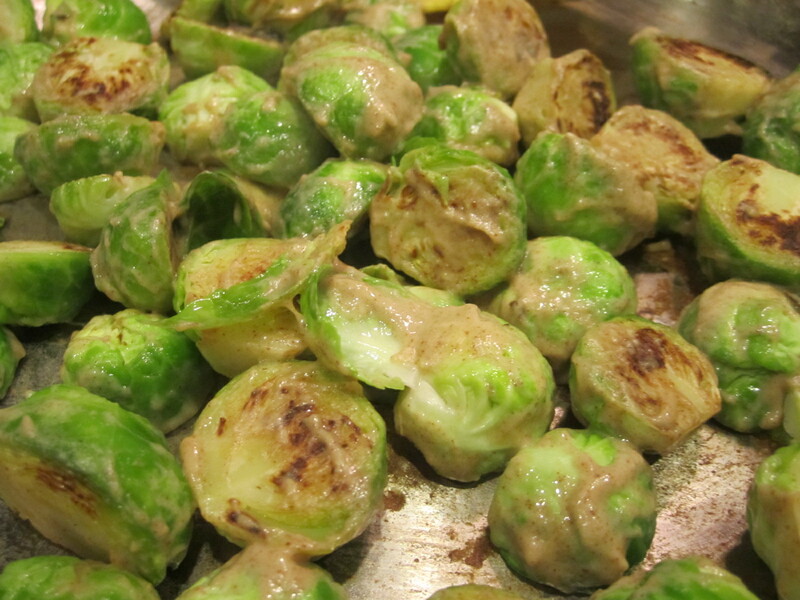 Turn your heat up to medium-high and make sure that they are all face down so that they brown and caramelize a bit. 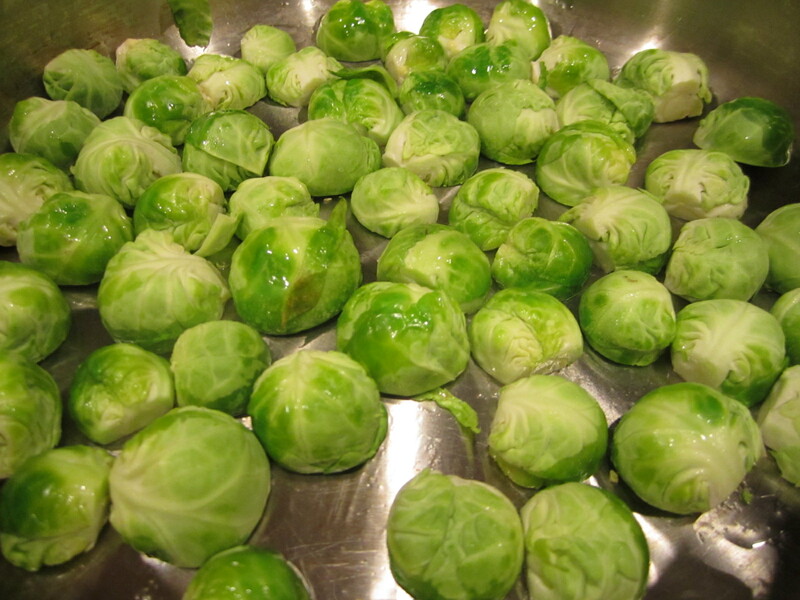 After 7-10 minutes of cooking, check your sprouts to see if they have browned a bit. 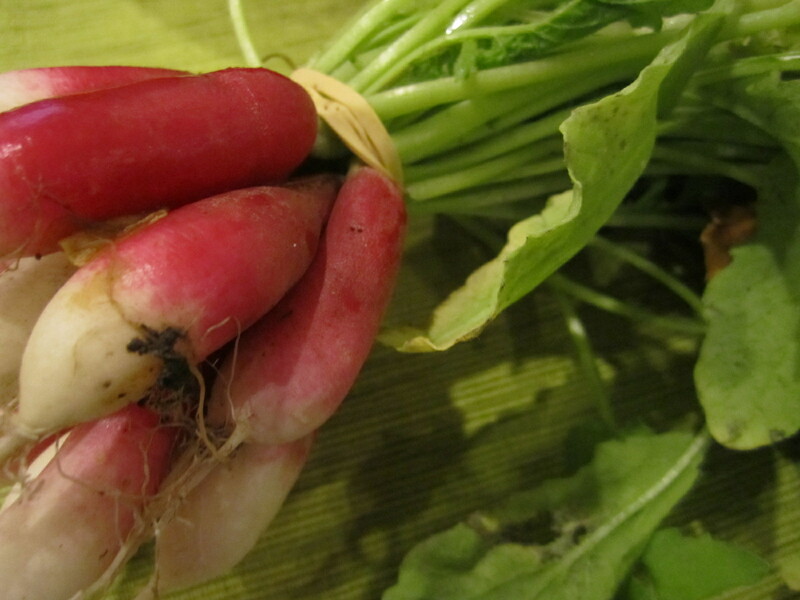 They should look like this…be patient!! 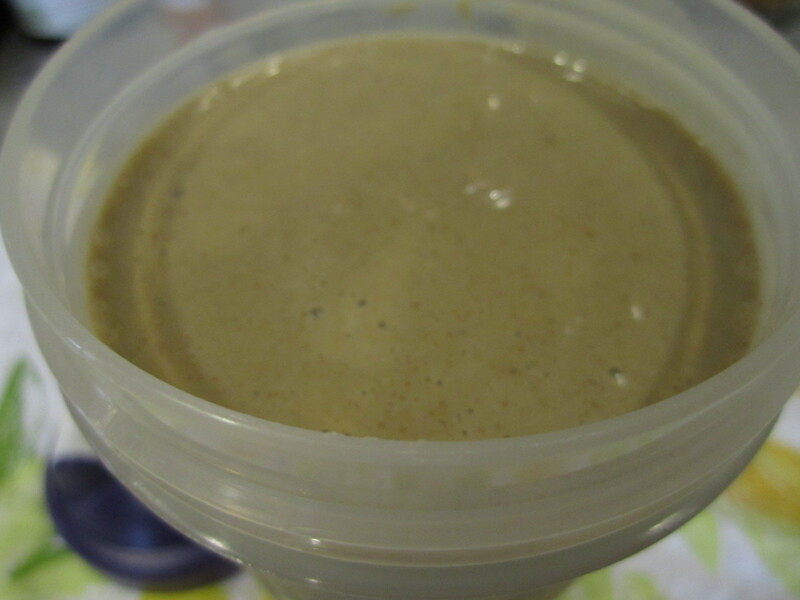 Once browned, turn the heat down to medium and add your mustard, agave (or honey), salt and pepper and mix. 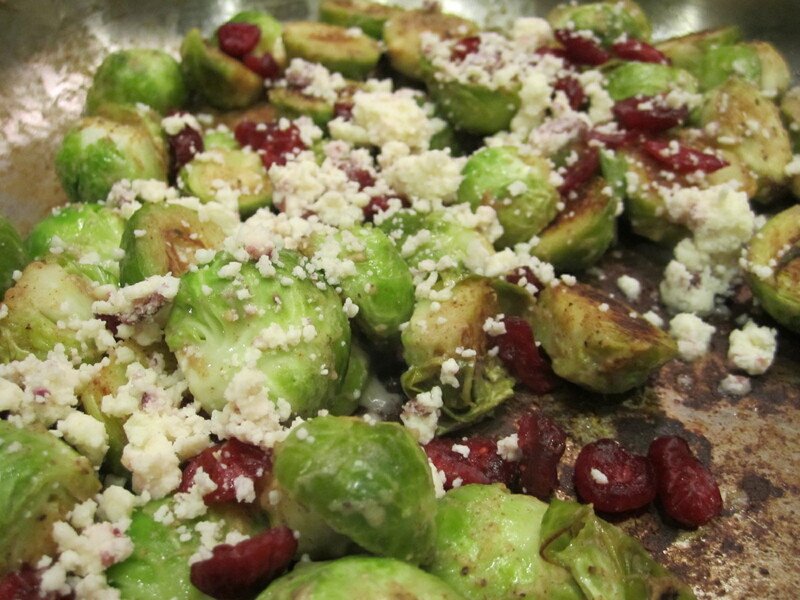 Then, add your cranberries and crumbled cheese. These came out great! 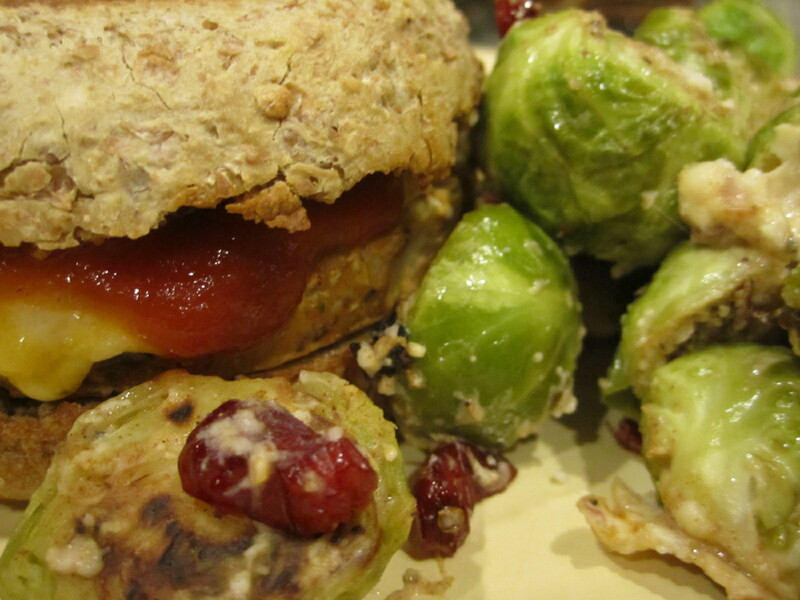 They were cooked perfectly and the spiciness of the mustard really balances out the sweetness of the cranberries and cheese. YUM! This weekend we spent some time visiting friends who recently had a baby. What better to bring them on a chilly Sunday afternoon?! A homemade meal! 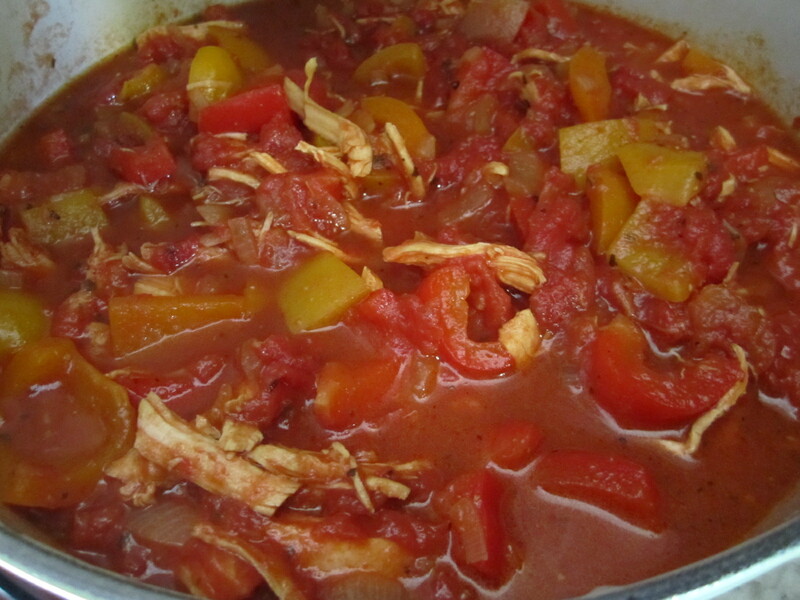 I followed Barefoot Contessa’s recipe for Chicken Chili exactly and it came out perfect! I didn’t take photos during all of the steps because it was much too messy at times, but it was fun to cook something that I knew everyone would love. I made the chili the afternoon before our outing and refridgerated it overnight. Personally, I think the chili tastes better the second day once the flavors have time to settle and mix with each other! I packed up the chili with some other chili staples. 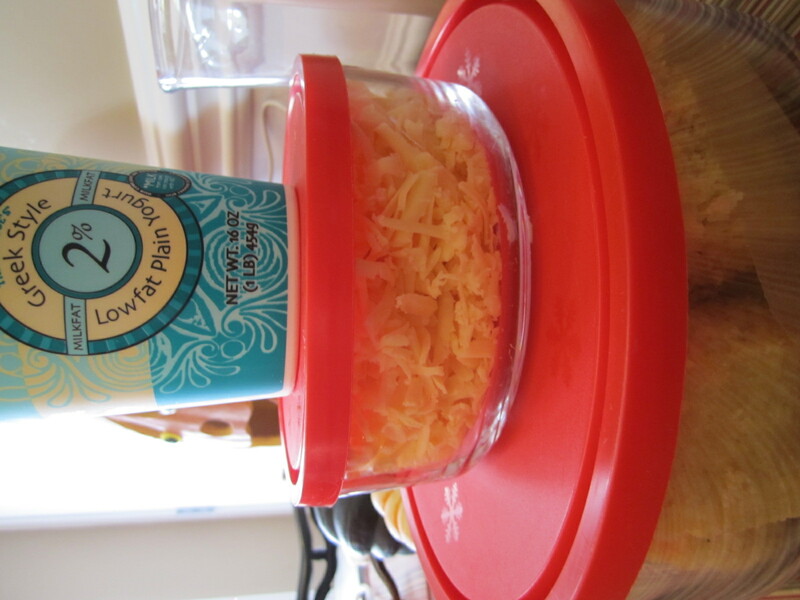 Greek yogurt (instead of sour cream), shredded cheddar cheese and corn chips! While I was packing up the Chili, Brant was working on pancakes for breakfast! 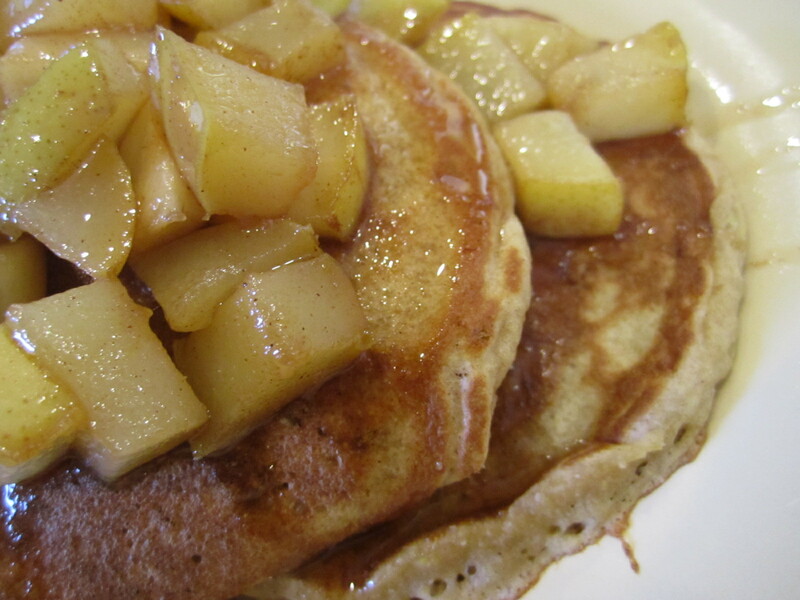 He made Heidi’s Favorite Pancakes, switching up a few ingredients. 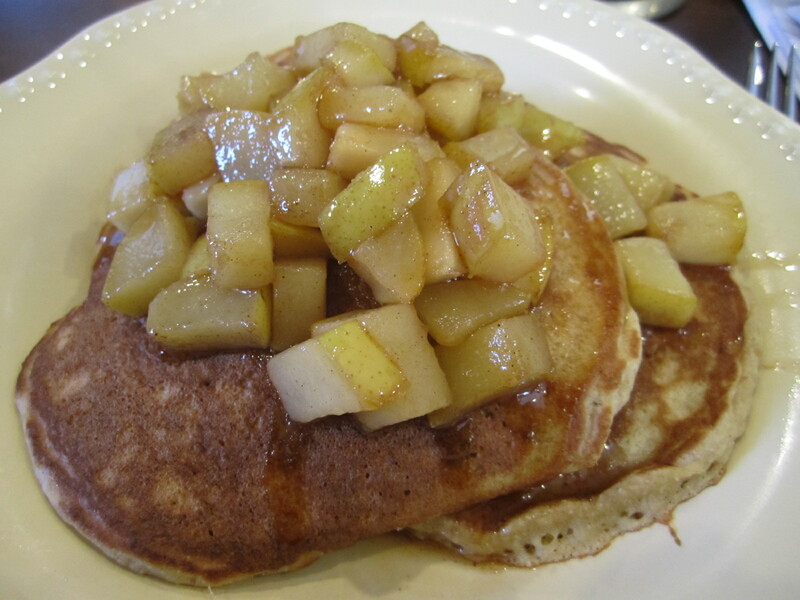 The bananas and greek yogurt kept the pancakes very moist and the cinnamon added just a hint of flavor! 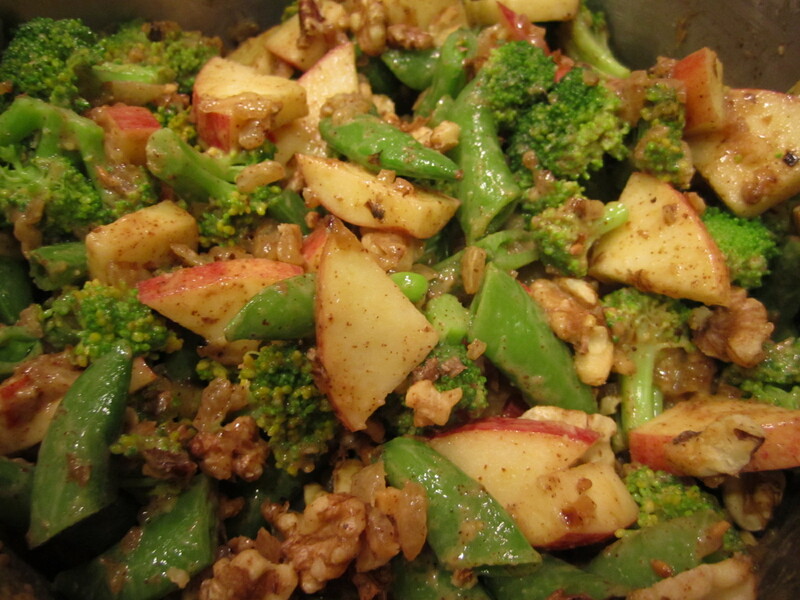 Simmer for about 10 minutes until pears are very tender! 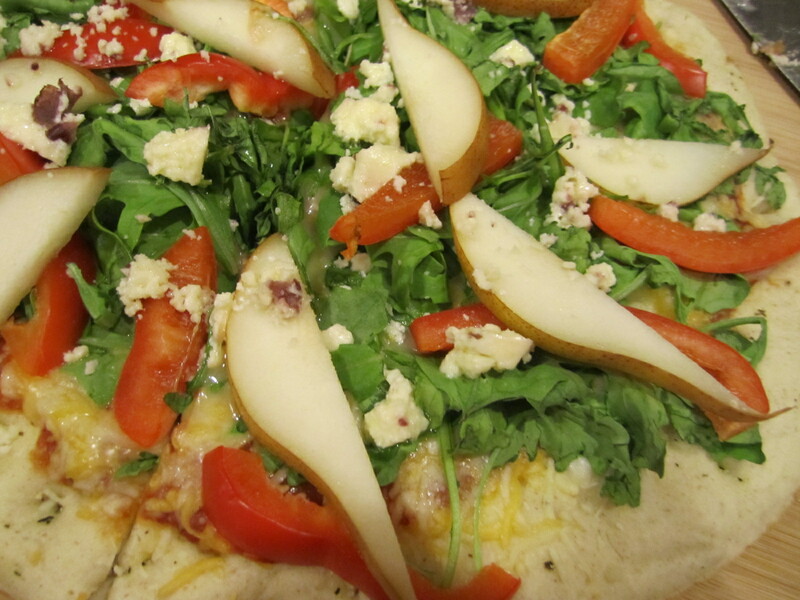 I made one of the best pizza’s ever on Saturday night – Pear, Pepper & Arugula! 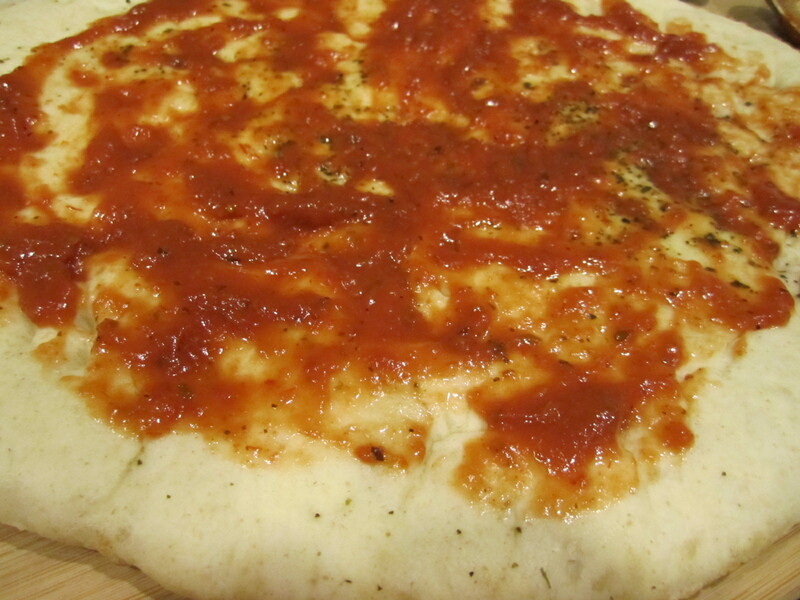 I wanted it to be a super quick meal, so I took a pre-cooked flatbread from Trader Joes and topped it with pizza sauce. 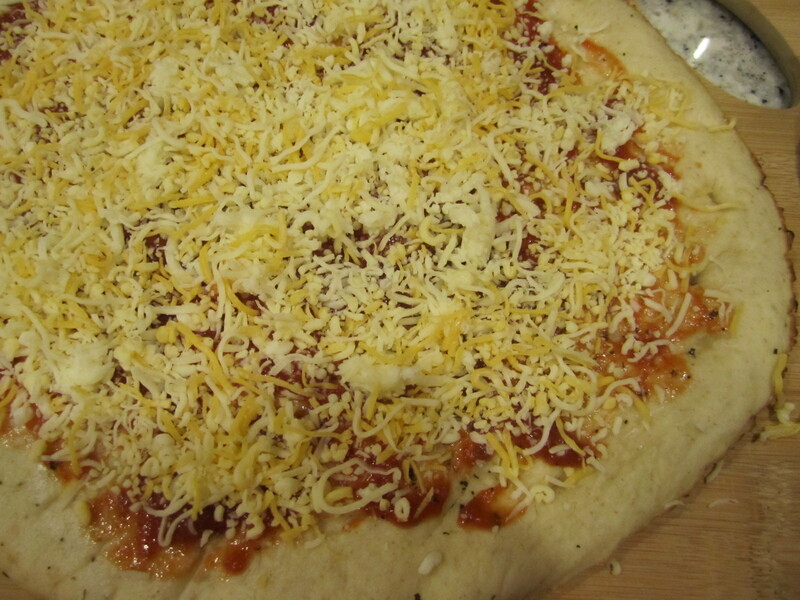 And a mix of mozzarella and cheddar cheese. 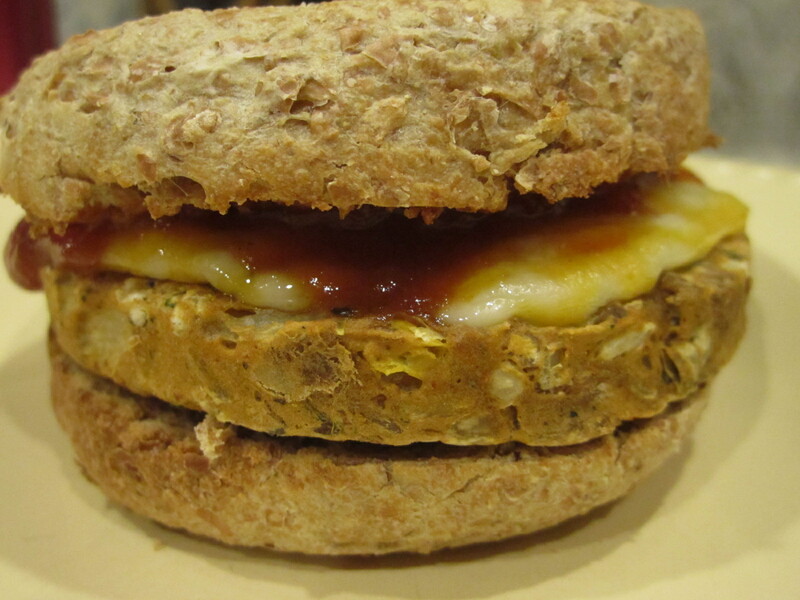 Then baked it for 5 minutes until the cheese was melted. 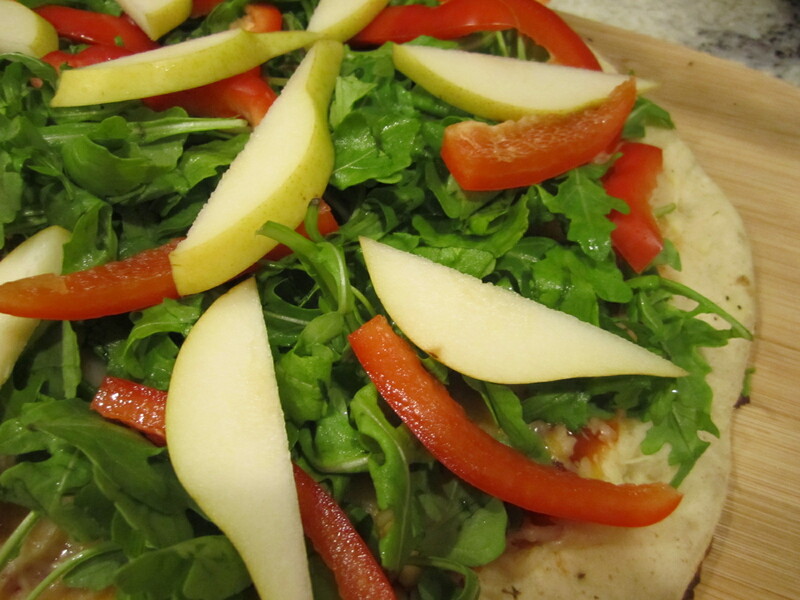 Once melted, I topped the pizza with fresh arugula, red pepper and a sliced pear and baked for another 5 minutes, until the crust was turning golden brown. Lastly, a sprinkled some stilton cheese with dried cranberries over the top and turned on the broiler for 1 minute until melty! This pizza was delicious! 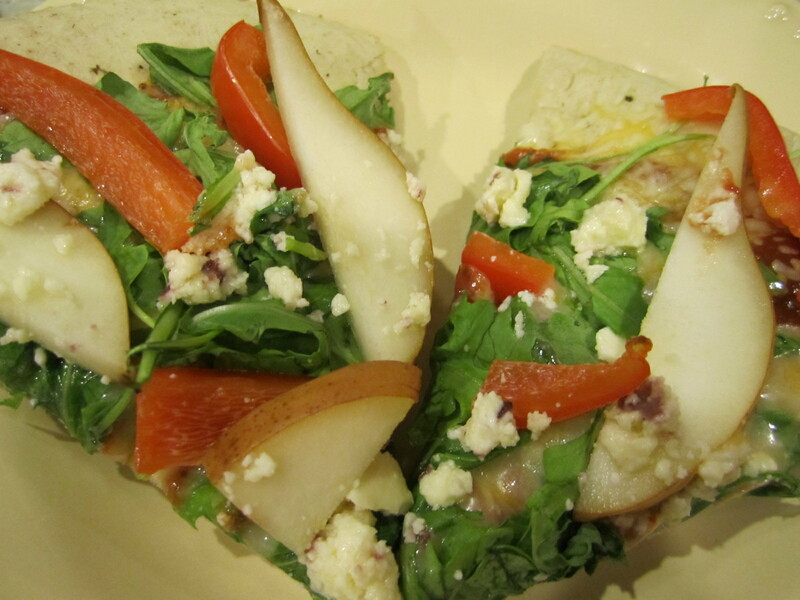 Sweet and savory all at the same time. It was great heated up the next day, as well. 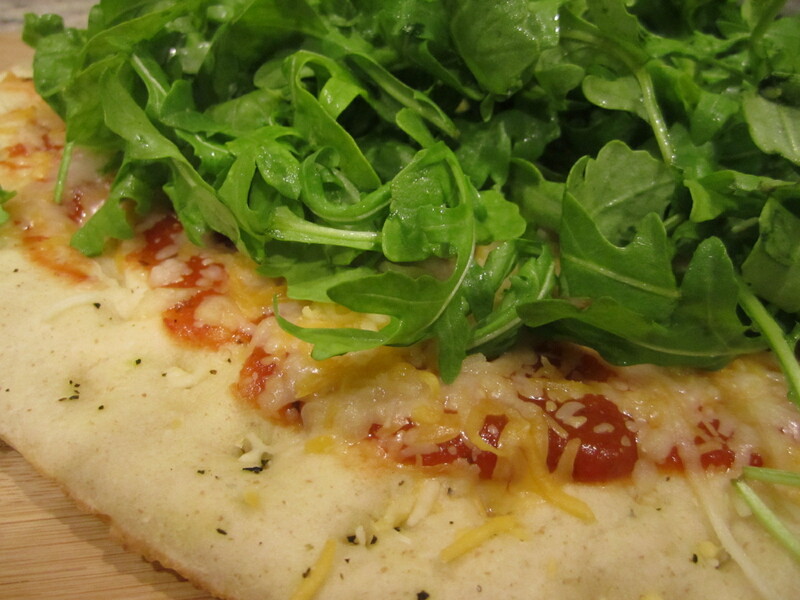 Surprisingly, the arugula did not wilt too much!